It's birthday time once again! This year, my buddy Mike and I decided to combine our respective birthdays into one party, seeing as how they fall so close together. And I, not having learned my lesson from last year, once again volunteered my place to be party central. Good times were had of course, but being a host is hard work. You can't really settle down, relax, talk to people too much because you're always running around 'taking care' of things. Now I know how JC (who hosts most of our parties) feels. Still, everyone else seemed to have a good time which is the most important thing right? And let's not forget the best thing about hosting a party, all the leftover goodies and alcohol that get left behind!! 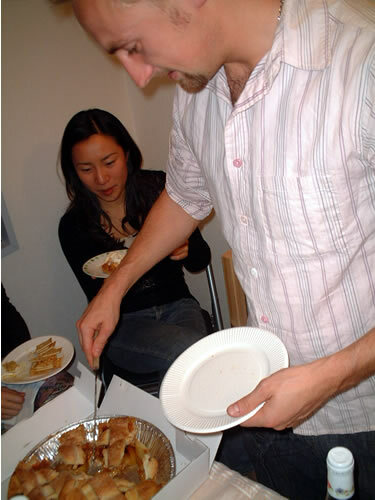 Here's the other Mike, happily cutting into the biggest apple pie I've ever seen in Japan (courtesy of Adrian and Jo). His birthday falls on April the 26th. Mine is on the 17th. We had the party on the 21st which had the benefit of being between these two dates, and on a Saturday! 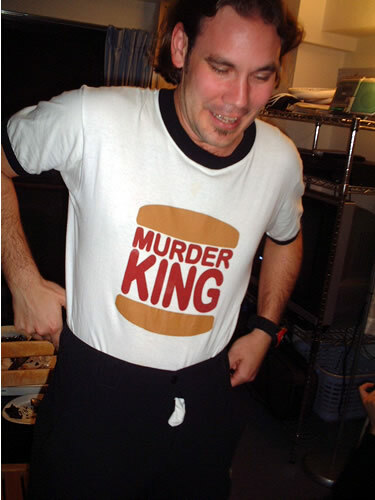 Jason's a die hard vegetarian which you can probably infer, and also like's to goof around. Perhaps he's not aware that he has a bit of a hardware problem down below? He was also responsible for bringing a ton of food including a huge chocolate cake that was eaten in minutes. Luckily I managed to get a slice. Girl talk! The 2 Kumis on the sides and Myong Fa in the middle surrounded the pie for much of the night. 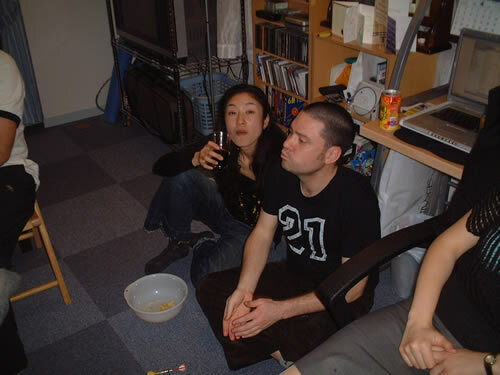 JC and Reiko chilling on the floor. JC can't go long without making some kind of interesting facial expression. The kitchen ended up being more popular than the living room for most people. From left to right: Hisa, a surprised Hitomi, Brady making some calls, Yuki and Dillon. 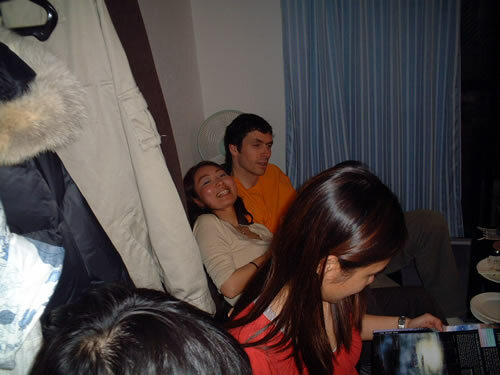 Yasuko and Bruno hanging out on the couch. In the foreground you can make out Jo reading my 'Universe' book, and the top of Adrian's head. Sorry to the people that my camera missed. Whoops, no pictures of me either! Anyone out there who came want to send me a picture of me? Thanks for coming everybody!